This is a machine that we previously sold. It did what it promised, it opened the third eye. However, it was completely effective but it only opened the third eye. The human needs other centers opened at the same time to create balance. For instance the crown chakra was not opened. Obviously when a person gains greater insight (because their third eye has been opened) they need additional guidance or else they will be overwhelmed by superfluous psychic information. That guidance should be provided by the crown center which connects a person to the infinite (or God). However, the frequencies we discovered 20 years ago did not open the crown center. That made life exceedingly hard for those who had their third eyes opened. Actually we have found that there are at least three frequency sets that need to be utilized when the third eye frequency set is used. So far we have only discovered two of the sets. Until we discover the other set this machine will have to remain off the market. Without the other sets I have to provide guidance (which I explain below) in order to fill in what the machine does not provide and I am tired of doing that. I'd rather wait and have the machine do everything when I determine all the frequencies. This is about the second most important ten minutes of your life next your birth. Or it could be. Ten minutes is the time it takes to open up your third eye using modern technology. 20 years ago I owned a small company. I developed and marketed machines that stimulated the brain using small pulses of electricity. 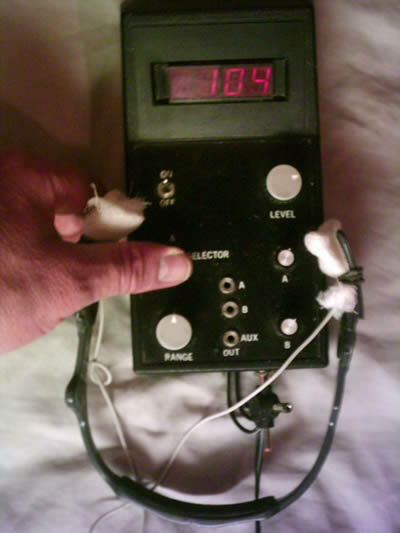 The initial machine I developed was similar to Meg Patterson's NET (neuro electric therapy) device which she almost exclusively used to cure drug addiction including lots of famous celebrities such as Pete Townsend of heroin addiction. It's 80% cure rate far exceeds amy other known therapy. The machine is called the Brainmax and I am currently marketing it for $400. You can read about it on this previous page. The way the Brainmax works is very simple. Various neuro chemicals are often suppressed by excess drug use or stress, etc (or are in low supply to begin with which in turn often draws a person into drug use in the first place). These neurochemical include endorphines, dopamine, GABA and various others. Certain frequencies of electrical pulses set up resonances which stimulate the production and release of these various neurochemicals. 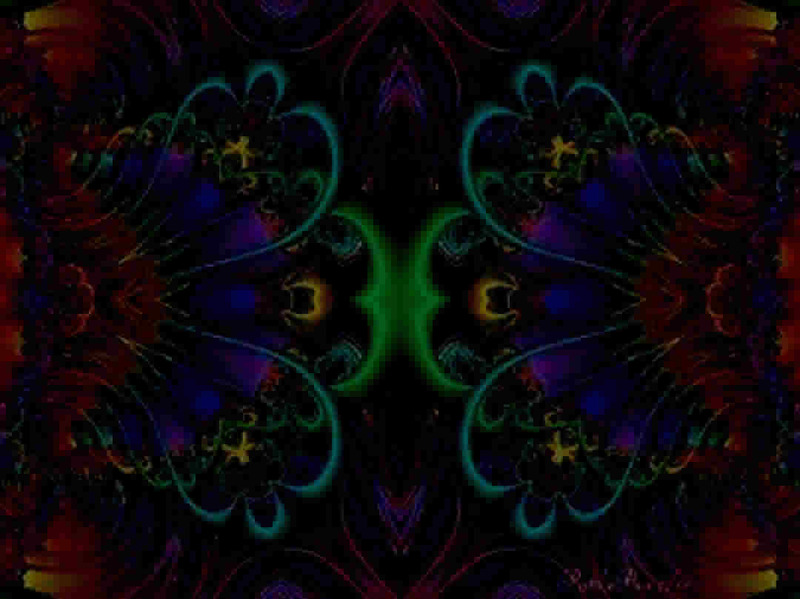 NET machines in effect exercise these neurochemical systems and bring them back to normal. Nothing else can. From there I developed several other machines and did thousands of hours of original and novel research. Most of the machines stimulated neurochemical systems but one machine I developed was unique in that it used multiple frequencies to stimulate specific areas of the brain. Yes, instead of stimulating neurochemical systems it stimulates actual areas of the brain. I mapped dozens of areas of the brain which could be stimulated but the most important one turned out to be the pineal gland or third eye. To be truthful the machine does not only turn on the third eye (and in a recent discovery the crown chakra*). What it actually does is connect up the third eye to the rest of the brain and that includes giving the person voluntary control of their third eye. They are able to open and close it at will. Even those who thought it was already open too far (People who had fully awakened and raised Kundalinis) found that the control which the machine gave them was complete and of iimmediate mmense value. It's an over simplification to say simply that it opens and gives control over the third eye. What it does is increase the volume or amplitude of subconscious information which includes dreams, all psychic abilities, medium ship, memory of past lives, etc. Normally the conscious mind is stronger than these 'spiritual' inputs. What the machine does by opening the third eye is that it increases the volume of these 'spiritual' inputs several fold making them 'louder' than the conscious mind. So it doesn't necessarily bequeath psychic abilities as such in those who do not have them. It mainly increases the amplitude of what is already there. The skill pretty much has to already be in evidence to some degree in order for the machine to have an effect. Twenty years ago putting the machine on others took a huge toll on me. The people I put the machine on needed guidance and I was unable to provide it. This was 20 years ago and at the time I was only several years into my path of self discovery. I did not have the understanding that they needed, an understanding that I could have psychically 'transmitted' to them if I had it myself. However, I didn't have it then. I still dont. That 'understanding' is what I spent the last 20 years obtaining. To all outward appearances it pretty much turned me into a big hearted hippy. I must remain responsible for administering this machine to others. I must provide an immense inner understanding that accompanies and offsets their newly opened third eye. (In other words I don't open your third eye and abandon you in inner space-void which is what I was unknowingly and accidentally doing 20 yeas ago.) I can only open one person's third eye every 3 or so years. The last person I used the 3rd eye machine on was Laura, who became my fiance. The machine works almost 100%. Two treatments several days apart is much better than a single treatment. Also, the person must use their third eye for it to stay open. If a person does not use their third eye after their treatments then it shuts down automatically. It goes dormant like it was before they were treated. In literature you can find many, many references to the huge relationship between sound frequencies and inner awakenings Here is only one of those pages which show that my work goes miles beyond what has been previously established. Nobody's work holds a candle to what I am developing. It is obvious to anyone with a brain that there must be a science associated with this field. I am the first person to start to establish it. Remember that only 250 years ago all scientists which researched electricity were decried, denied and died, burned at the stake as the devil's representative for interfering with God's power. That is primarily why it took a man (Ben Franklin) in a country known for it's religious freedom (America) to lay the groundwork for investigating that field and thereby save thousands of lives with his invention of the lightening rod. I went on goggle and searched for third eye opening (and also third eye awakening). There are literally thousands of pages on different techniques and my machine trumps them all. Two treatments of ten minutes is all that is needed and then it is done. The effect is almost always immediate but occasionally it is delayed a few days. Some people experience a curve of increasing effects. This machine is far better than anything that is out there. I know that many teachers in India offer to open the third eye using psychic means. I used to sit at the feet of one such master (a Hindu whose name was Swami Vithari Maharish) and he was able to do as promised to a degree. He was known as one of the greatest at awakening peoples third eyes yet he was no where near as effective as my machine is. (I could never say this if it was not true without a great fear of spiritual retribution, such as curses, from other masters.) He used his forefinger for the awakening process. The process itself took months or years, was only partially effective and did not result in giving you any control or ability to open and close it on your own accord. What are the direct observable effects of an opened third eye? This has been described fully in both the east and west. All you have to do is make a google search to find your fill of information. Some would simply equate the immediate effect of the machine to a drug high and say that it is akin to a quarter or half dose of LSD that you can turn on or off at will. That of course is cheapening the experience/effect. It is far more than that. It amplifies the inner realms by a factor of several fold. Psychic abilities are increased in those who have them and in those who don't have such abilities most people gain them a bit. Intuition is also increased several fold. It takes years...perhaps a lifetime to fully understand and integrate what it starts. It amplifies and intensifies many of the higher connections in the brain. If you have psychic abilities latent or active then it will increase them several fold. I don't know if it will create psychic abilities in a person who does not have them but again, for anyone who has psychic abilities (latent or active) they are almost certain to be increased several fold. Meditation is 'better' or should I say more effective and productive. There is also an understandable increased draw away from material goals towards the more spiritual. A person who is a medium will probably increase their abilities to the point where it is as if they are talking to a live person in the room. I have never found it to be an over whelming experience. For one thing the machine give's a person a substantial amount of control over their third eye. A person can turn it off or down at will. It also gives people understandings of a higher level. The flood of information that an un initiated person might find overwhelming is just seen as normal by someone who is initiated. You get used to the higher realms and they no longer seem out of the ordinary or unusual in any way. However, I only put several dozen people on the machine and though none of them have reported ill effects possibly someone may in the future. So if you do not want the effects that I have described it would be a good idea not to ask to use it. It adds a flexibility to the brain which most post adolescents lose. Strictly speaking in Tibetan Buddhism not much growth is expected of anyone who is older. It's just expected that they no longer have the capabilities to grow and change as much as a younger person can. The third eye machine completely reverses this. The ability to grow and change is taken back to pre adulthood in those who use the machine. They become as if children in their flexibility and ability to change as well as learn. Then there are those who are born with psychic abilities. These people are usually in a class by themselves such is their greater ability as compared to those who become psychic later in life. This machine can almost completely eliminate that difference. However, though none of these people who were 'born with a veil' have used it I'm convinced that they can benefit greatly from the use of this machine. Some people have stated that the machine is not 'natural'. That is absurd. There is nothing more natural than electrical impulses in the brain. It's God's way of healing and communication between nerves. To get down to the basics what is 'natural' about twisting yourself around like a pretzel doing yoga poses? Nobody in their normal day to day routine ever approach even 5% of the known yoga poses. Or lets take meditation. It's unusual to say the least. Under normal circumstances a person never sits for an hour (or up to four in my case) with their eyes closed while awake and alert. It's just not 'natural'. The Brain Booster is just a tool which is what yoga poses and meditation are (and in fact exactly what Buddhism is**). Instead of directing a chi force within the body the machine simply directs electricity within the body. It's in fact the very best tool in existence today. What are the down sides? They are down sides only if you see them as such. You will find it hard to fit in. You see through the mundane and loose the need to patronize others. It's just no fun for them having the solid truth standing in front of them and ready to tell them what the truth is! For this reason it is good to use the machine between emotional relationships and not while you are in one (unless both members of a couple plan to use it). If you use this and your partner doesn't then you are going to be on different wave lengths. You are just not going to believe their crap. Not theirs or anyone's. That brings me to another point. By it's very nature this awakening increases a person's IQ by at least 20-30 points. That is if the person integrates the Third eye fully. (Remember the third eye can be shut down and only opened occasionally in which case it has a minor effect on the over all functioning of the brain.) All these things can bode ill for pre existing relationships although they can add to them and make for very strong new relationships. Now, I ask you are these negative or 'down sides' to the machine? I don't see it as a down sides. Oh, I have to bite my lip a lot and feel sorry for almost everyone who has never used the third eye machine. It's not my problem though. However, now I am mired in the corruption of the UK in a horrible way. We are merged and sometimes completly. I often feel everything she does and what they are doing to her is horrible. It's effect of the machine is not impelling or forceful in any way. The machine gives you full control. What it does do though is entice you. It entices you to open your third eye more and to explore the inner realms more. That is all. It is a heck of a seduction. Life will never be boring again, I can tell you that. *As I stated the machine stimulates various areas of the brain. One of the many areas it stimulates is associated with the crown chakra. I'm not certain which part of the brain that is associated with but because it is so strongly affects the Third Eye/Pineal I think it is only appropriate that I mention it here. The Crown Chakra is responsible for directing the third eye on a more spiritual path, it takes it higher and rise above it. Without it, as one person said, 'the third eye machine just seems to open me up to more insight into the crap which I did not even see before'. The crown center is a very important adjunct to the third eye. **Buddhism in it's purest form is simply a group of tools. Too many people have decided to make it into a religion. It really isn't. It's a path designed to take a person to enlightenment (and technically beyond but you should be able to supply all the answers yourself after you get there). At least that is what Buddhism was when it was created. To many people focus on Buddhism as an end unto itself (a religion) and they have lost some or everything it is intended to assist in creating. Unless they change dramatically they will not get to the enlightenment that they profess to be seeking. At least not in this lifetime. If science had been more advanced 2500 years ago then the Buddha would have probably invented the third eye machine and insisted on incorporating it as a significant part of Buddhism. Disclaimer: the Brain Booster is not a medical device. It's use is for experimental purposes only. These statements have not been evaluated by the Food and Drug Administration. This product is not intended to diagnose, treat, prevent, mitigate or cure any disease. If you have a health-related condition that requires medical attention, always consult with a licensed health care professional. Individual results will vary.